Mobile Casey and Stripy Jack are mobile phone cases or jackets. I initially made Casey (right) as a birthday present for Mike. I worked on him on the subway and on my lunch break at work so Mike wouldn’t know. He’s a big fan of the Ugly Dolls, so Casey and Jack are kind of like fan art, I guess. 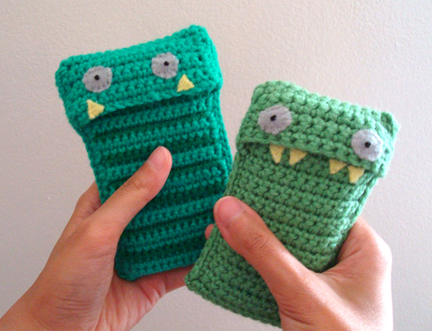 Mike loved a cellphone‐eating monster but it was a bit too snug for his iphone, so I ended up remaking the design and created Stripy Jack (left), who fits the iphone perfectly. Casey, however, fits my phone perfectly. And I have a really basic phone that is 1 3/4″ wide, 4 1/4″ tall, and 5/8″ thick. So the smaller pattern may fit a phone with similar dimensions. so he can use it like a sleeve, plug in his earphones, and put it into his pocket. So Casey and Jack were designed around that idea. 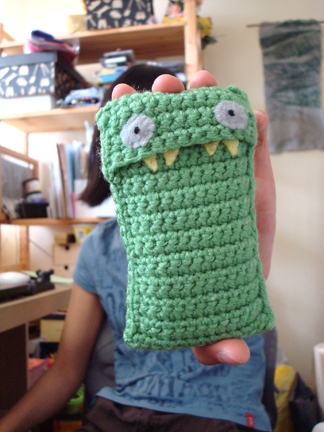 To make your own mobile phone‐eating monster, you’ll need some worsted weight yarn (I used acrylic because it’s nice and durable) and a 3.75mm hook. And a bit of felt and sewing needle and thread for eyes and teeth. It’s really rather straightforward and size is easily adjustable. Row 1: ch 15, 1 sc in 2nd ch from hook, 1 sc in each ch across, turn. Row 2: ch 1 (does not count as 1 sc), sc in each sc across, turn. Repeat row 2 until piece measures 11 inches, fasten off. 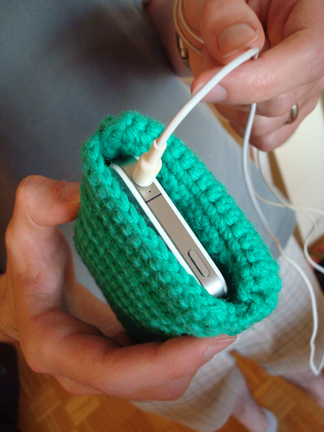 Secure the folds with pins and crochet the two long sides together. In the top part where there are three layers of fabric stacked together, crochet through all three layers. Cut out teeth from felt and decide on placement. It’s best done with the phone in it, so you can see how much the top of the teeth and the front flap need to overlap (I didn’t have the phone in mine but it worked out). Sew teeth to the piece behind the front flap, and eyes to the front flap. Because when the front flap flip backward it will leave the stitches behind the eyes exposed, here’s a way to hide the sewing stitches behind the crochet stitches (the tutorial is for sewing a lining to a crochet bag, but I hope it helps!). And here we have it, Mobile Casey! :D He looks concerned for some reasons… hmm. Row 1: ch 17, 1 sc in 2nd ch from hook, 1 sc in each ch across, turn. Repeat row 2 until piece measures 12 inches, don’t fasten off. Row 4: ch 1, 1 sc in each of next 8 sc. Fasten off. 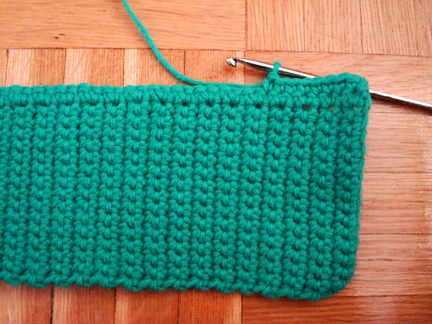 Row 5: Attach yarn to corner diagonal from beginning of Row 4, ch 1, sc evenly down the other long side, turn. Row 6: ch 1, 1 sc in each of next 8 sc, fasten off. Pretty easy, eh? Feel free to drop me a note if you have any questions! wow, you’re quick! i used worsted weight yarn and a 3.75mm hook. it does have a bit of room around it, especially headroom, so it flips easily. but i also have a pretty tight tension. what size did yours turn out? If you want to assure the right size, have your phone by you when you make the chain. 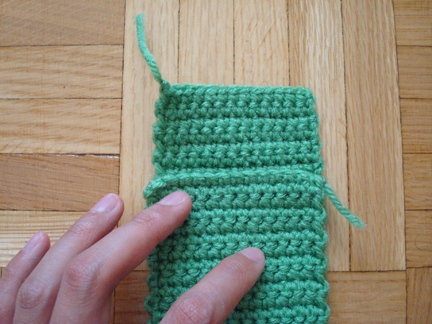 Make the chain about the width of your phone and continue, adjusting the whole project the same way. It is not hard. I am doing it for a 1 by2 flip phone. Way to big hahha xD It could have fit one and a half ipods. xD I may have to make some alternations for myself, I don’t have a 3.75 hook. I was wondering how you made Jack have stripes. It looked like different colors so i was confused. Thanks! This is just one of the coolest ideas I have seen for a phone case!!! I LOVED it and have been busy posting it to all of my family to see — even those who can’t crochet. I suggested these to my Mom, who lives on a fixed income, as a great way of using up her stash yarn and making Xmas presents that everyone would love. Rarely does a pattern really grab me, but this one did — it is just soooo fun. thank you for linking! i love your blog! Found you through tangled happy. This is so cute! Fab pattern! So easy to make ‘n’ adjust! Just started small production for X‐mas market in me man’s school. Kiddos gonna luuuuuv them:) Thanks a million!! what did you make the eyes out of? I am now making jack, but it the sides keep ending up crooked and I have to go back and fix it, I would almost have him done by now if it weren’t for that. Im not sure if im doing something wrong or not. I have the right yarn and needle, so I was wondering if you had any tips. If not its fine. Thanks!!! hmm. everything will be ok as long as your stitch count on each row is correct. when i first started crocheting i always got confused about whether i should crochet in the very first stitch in each row. for jack, begin each row with a ch 1 but it doesn’t count as a stitch, so make sure to make an sc in the very first sc of the row. then when you reach the end of the row, sc into the last sc, but don’t sc into the turning ch 1 from previous row. if the stitch count is correct and the sides still look wonky maybe it has to do with tension. that can be fixed but tucking and pulling it a bit afterward. and after you sew the front and back together the sides will look more straight. 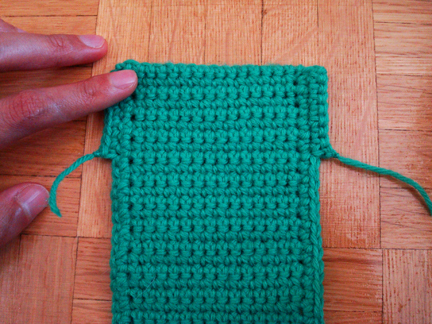 Are you slip stitching the sides together or single crocheting? Love the pattern by the way, it’s adorable! thank you! 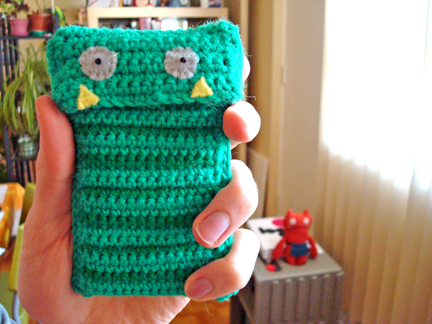 :D i used slip stitches. hi! i found your blog through tangled happy, and i love the phone covers…sooooo cute! 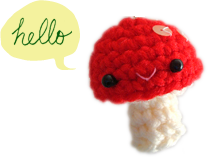 i’ve pinned you to my crochet board so i won’t forget…i’m going to make a couple of these as gifts! thanx a lot! Do you sell the mobile casies? If not then you should definitely consider it. Its amazing and perhaps more reliable and customisable than the one you get in the market. For the larger case, do you have to make the extra room on the sides? hi Emma! yes i would still make the extra short rows on the sides for a case of any size. hmmm… definitely give it a try! you can do a 19 ch and then do a couple of sc rows, then measure it against the width of your phone. if it’s slightly longer than the width of your phone then it should fit. hope this helps! Hi, I found your blog when I was looking for a beginner’s crochet project. 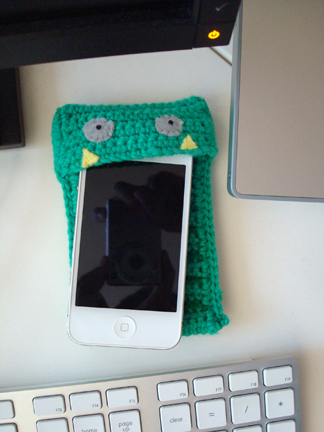 Your pattern was really easy to follow and now I have my own pink monster to protect my phone. The only adaptation is that I glued rolling plastic eyes on my monster. 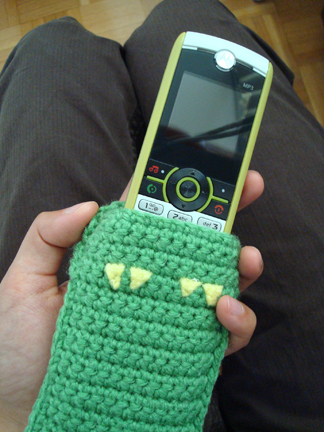 I put a photo of my creation on my blog (it is in Danish, sorry) and I linked to your blog for pattern details. Thank you so much for trying out the pattern! your pink monster phone case is awesome — i love it! Hi Pat, thank you for trying out this pattern! 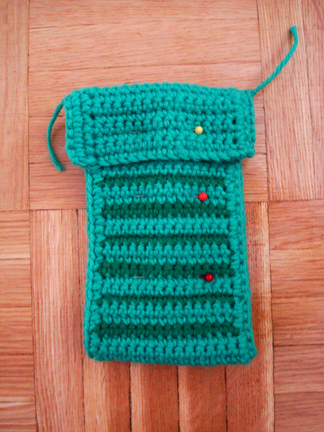 So, your question about where “diagonal” and rotating was mentioned — after you finished crocheting the case to 12″ or desired length, turn the piece sideways, then do rows 3 and 4, in which you crochet up and down one of the long sides of the case. 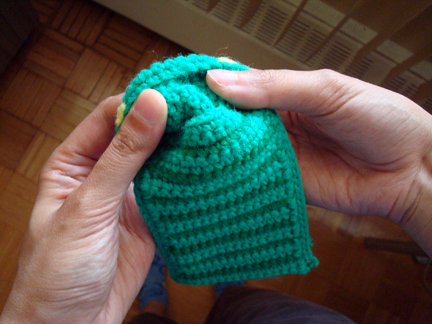 You would then fasten off the yarn, and the re‐attach the yarn to the other long side, and then crochet up and down the other side of the case. 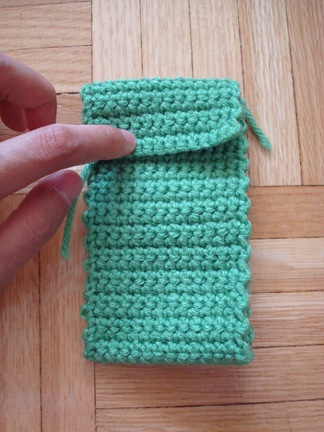 You can make both the case and the flap longer by repeating row 2 for as many times as you like. You would do a few more sc’s in row 4 if you want a longer flap. Hope this helps! Hi there! I love this pattern and I was wondering if I could make some slight changes to it,(I want to revise the pattern a bit so it can be worked in continues rounds instead of sewing up the sides becuase I’m lazy) I also might be creating a blog in the near future, would it be okay to post your pattern on my page with full credit to you and your link? My goal for a blog is to make a site where all the patterns are free becuase its nice not to have to buy all the cute patterns. Thanks and hope to hear from you soon! 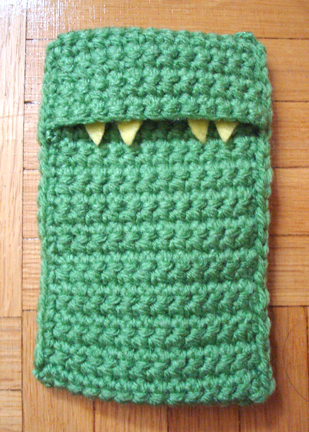 Hello I’ve been looking for a pattern I could use for my iPod touch but I can’t seem to get it right I’m using a thicker yarn (a worsted 4 ply yarn*peaches and cream yarn so cute and not that expensve as so many other yarns are to give it more of a buffer if it were to drop and a 5.0 mm but I can’t seem to make it work could you give me some tips on how to make my iPod touch actually fit because I absolutely adore this pattern the dimensions are 2 and 1/4th inches wide and 4 and 6/16th inches wide sorry I’m not the best at measuring when it’s past the 4th marks any help would be greatly appreciated. Hi Madison, thanks for giving the pattern a try! I’m not sure what you mean by not working though… If you’re using a 5mm hook, I’d imagine that your phone case will turn out too large. 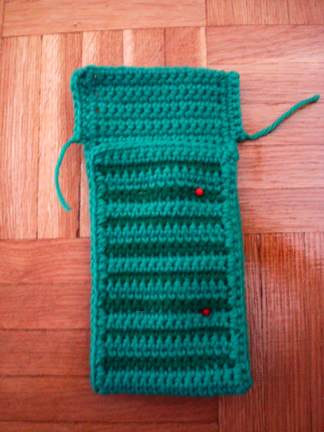 Try using a 3.75mm hook as indicated in the pattern with your worsted weight yarn, and following the pattern for Jack the larger phone case (which was made for an iphone 4, which is similar in size to your ipod touch), it should work out. Hope this helps, happy crocheting!